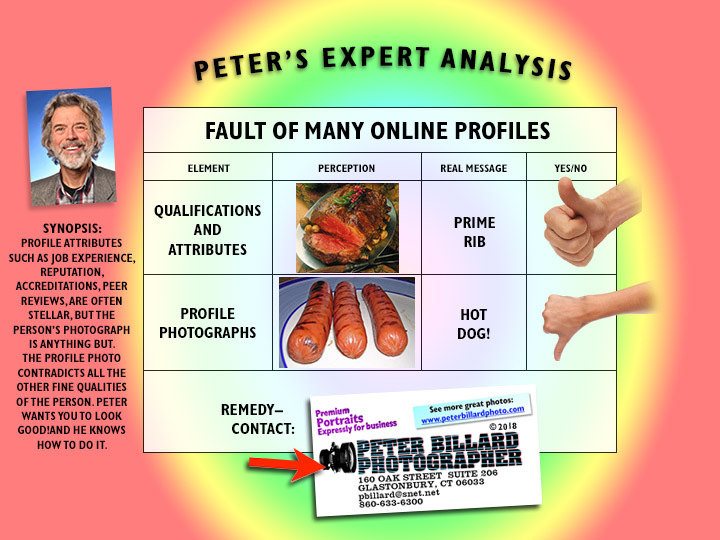 Does Your Profile Photo Resemble Hot Dog or Prime Rib? 09 Oct Does Your Profile Photo Resemble Hot Dog or Prime Rib? Does Your Profile Photo Resemble Hot Dog or Prime Rib? You control your online appearance by projecting a professional and capable image of yourself and your business or service. A snappy looking modern website, including a list of your accomplishments, testimonials, accolades, and more, all serve that purpose. An impressive and persuasive web presence requires that all the parts pull together and reinforce each other in communicating a positive message. But of all things, don’t neglect a professional looking photo of yourself. Why do I say that?––because as a photographer who creates good portraits for people, it hurts my eyes to see sub-par portraits when everything else is superb.